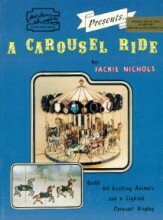 60 full-size patterns of carousel horses and animals and a charming carousel. Step-by-step instuctions for constructing the finished project. Complete with color suggestions, assembly tips, historical notes and more! Click the button below to add the A CAROUSEL RIDE 3-D PATTERN to your wish list.